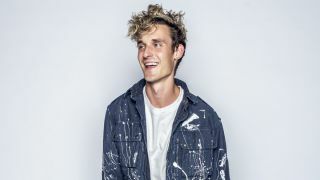 A student of funk, old-school hip-hop and dance music history, producer GRiZ’s fifth album, Ride Waves, comes off the back of an eight-month-long period of social media abstinence, personal self-discovery and artistic growth. Fortunately, the man who also goes by the name of Grant Kwiecinski has found time to write some seriously large tunes, too, and to rope in an eye-catching list of collaborators. Wiz Khalifa, Snoop Dogg, Matisyahu, DRAM, and Bootsy Collins all feature on the record, which, as its title suggests, is GRiZ’s take on “the emotional rollercoaster that is life”. We asked Grant to take a few moments away from this philosophical fairground ride and talk production. Based on a career spent in the studio, here are his five essential pieces of advice. “Having a sense of quality control is a good standard to keep when you’re producing. But when you get too caught up in whether something you’re creating is good (or not), sometimes you can lose style or personality, or lose a sense of direction. “I always keep myself into my craft. It’s not always an album or a single or a released song I’m working on. It’s not always about that for me. Most of the time I just let myself create until I run out of steam, and then I take a step back to see what it is I’ve come up with. Just because I spent 20 hours on a song and it never gets released doesn’t mean that it was a waste of time. “The process is everything for me. The time spent is practice, fleshing out new ideas and techniques; growing. That is so important for me. Doing different things, learning and then applying those lessons to other projects that might develop into releasable songs. “The process is everything for me. The time spent is practice, fleshing out new ideas and techniques; growing." “I try not to let myself get stuck on anything, either. If I’m working through a vibe and it just doesn’t feel right, often I save it and then try something else. I love sitting with something until the last possible minute, but don’t be afraid to scratch something completely and move on. It feels good to just delete a project and move on. 3. Feeling stuck? Switch it up! “If you feel like you keep ending up in the same spot, try doing things differently. Work at a different tempo but apply all of your typical methods to it. Work without any digital synths. Try resampling unmelodic sounds into instruments. Download some new drum samples that you would typically stay away from. Use a vocal for a bass sound. Try using 808s! Try not using any 808s! And then see what happens from that. “I’m really big on hearing the overall sound of the sound, and not just that there is a sound present in the mix. That is what makes the sound interesting. If there is too much going on, you’ll bury all the good stuff in noise. “You’ll honestly only ever feel horrible about what you’re doing if you start comparing what you do to others. There is a reason why people will like what you do, and that is because you are the one doing it and not someone else. “Your touch and the thought/decision processes that go into your productions give them your specific style. And there is a fan for every creator. Your whole focus should be about expressing and satisfying that drive within your heart. So do that. Don’t bog yourself down with the interference of comparison.